Titanic On Wheels - Cars! Cars! Cars! I dont think Mc Jumbo Truck up there is going to "stop on a dime" - no matter the air brakes, specialty trailer tires, or number of wheels it has. Force=Mass X Velocity/Time. That means the force of the brake pads on the wheels has to be equal and opposite to 26,000 pounds X however fast you are traveling. I don't think "dime" will cover it. As far as licenses go, I think the amount of accidents on the freeway speaks to that problem. I support measures about cell phone usage, but have been even more blown away by people cutting tractor trailers off on the freeway. And winter is coming- driving conditions will only get worse. Those of us who have had training should be able to go out and buy the CXT if we want to. But then again I said those of US who have had the training to drive something this big. The guy wants to make a point. That's for sure. More money for registration wouldn't stop the joker that can afford to buy one of these. Trucks this big are definitely different to drive but I have a different feeling about driving tests. Since I started driving an eighteen wheeler just over a year ago I believe EVERYBODY should have to log some time in a big truck just to get a feel for what the idiots driving four-wheelers can do to jeopardize each other's lives with a simply foolish manuever. 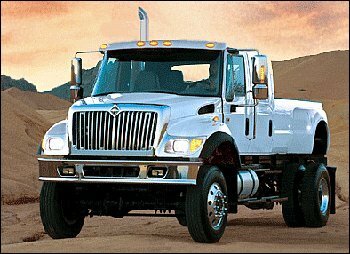 Nice slam on International but did ya check out the GMC or Ford behemoth? Oh, and HELLO! but guess what kind of license gets the average dope behind the wheel of a U-Haul!